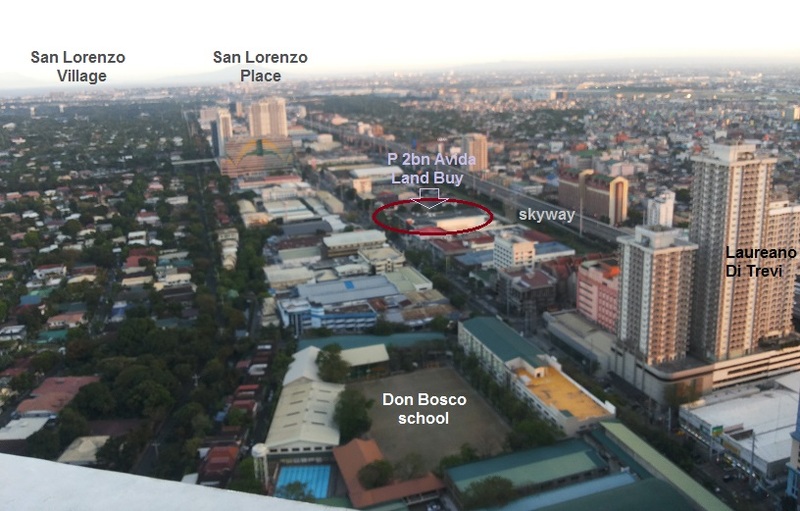 Chino Roces / WalterMart to Magallanes - A future Hotspot? Chino Roces / from WalterMart to Magallanes - A Future Hotspot? Big developers have major land holdings along this road. Avida delivered two towers (in 2014? and 2016), in a project called Avida Tower San Lorenzo next to WalterMart. Further down the street, CityLand and Vista (Trevi) also have also completed projects very near Waltermart and the Pasay Road PNR station. Studios within the Cityland buildings rent for something like P9,000 -10,000 monthly, the lowest rents on Chino Roces. At the other end of Chino Roces, next to the MRT station at Magallanes is a nearly completed project called San Lorenzo Place. San Lorenzo Place ("SanLo Place") is attached to Magallanes Station, though the passage was not yet functional last time I checked. 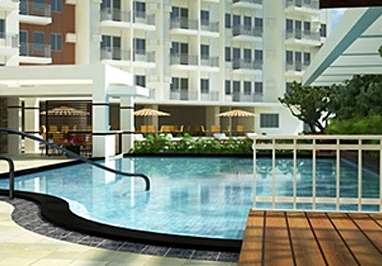 DMCI's Fortis Gardens will be launched soon. It is just across the street from San Lorenzo Place. Peso 2 BILLION ! : The land cost Avida just under P 2 Billion for 11,000 sqm of Land - if Avida builds 2,000 units there, then the Land alone will cost P1mn per unit (on average). Compare this, with the recent cost of about P2.5 million for 22sqm studios at AT SanLo - and you will see that Avida must have some big plans for this space. The will need to build a large project, and achieve a higher average price than the did for AT SanLo to recover their big investment. Does the appearannce of a thread mean that Avida will soon be announcing a new project there? Asten near Guy Puyat has launched its final phase in the last month, and Avida may want to have a new Makati project on its drawing boards. 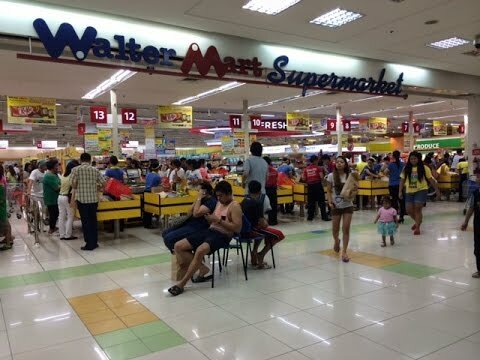 WalterMart - a mid-priced alternative to "expensive" Greenbelt and Makati Sq. "bargains"
Avida Tower San Lorenzo / "Avida- SanLo"
Bay View - Here's how the view looks from a high floor in Tower 2 - pool is below the highway on the Podium ... PB. Avida San Lorenzo / "San Lo"
AT Sanlo to Greenbelt malll is very walkable ... PB. It is also across the street from Pasay Station on the PNR. 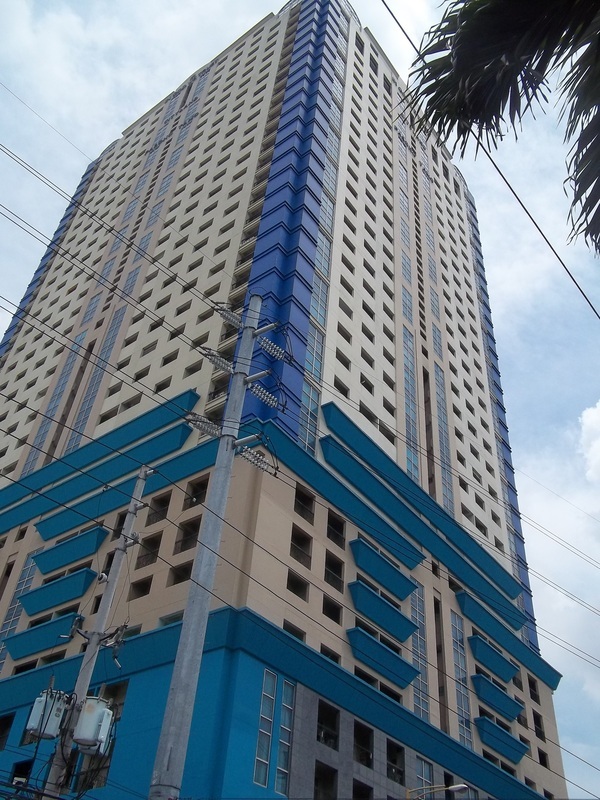 Avida Towers San Lorenzo along Pasong Tamo extension, the condominium boasts of 1,132 units in two towers. Units cost anywhere from P1.8 million to P4.5 million, the company said. 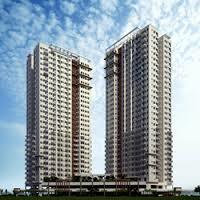 (2 units/flr) 2 BR (~52 sq m) - Php4.16mMThe first tower’s construction, which has 30 floors, will begin in the third quarter of this year. It will be turned over to its owners starting 2013. 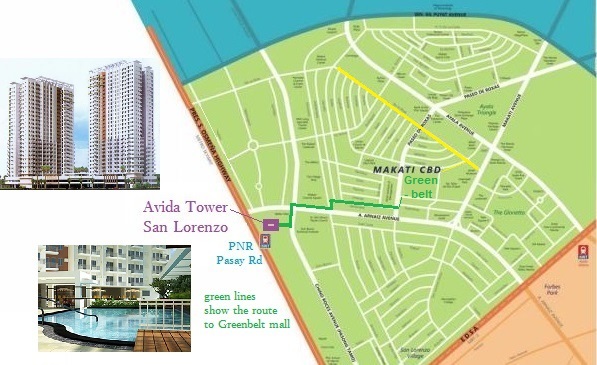 The project is a joint venture with Makati Greenbelt Palms Land Inc., owned by Chinese nationals. The 8,070 square meter property, where the project is situated, was contributed by MGPLI. Avida Land officials refused to divulge details about the partnership but said MGPLI will get the “equivalent units" for their property. After hours, Avida Towers San Lorenzo’s superior location will allow these individuals who work hard and play hard to freely enjoy the leisure options available at the Greenbelt and Glorietta malls without the hassle of a long commute home. Cityland Calle Estacion (Cityland Pasong Tamo-Estacion) is located along Calle Estacion, just across the PNR Pasay Road Station. It’s Upper and Lower Ground Floors house several commercial establishments. * Living near your place of work saves you both time and money. * Tired of eating fast-food? Cook your own food! * Tired sitting in traffic? Enjoy more free time (since you no longer commute) to watch your favorite Cable/TV show, DVD, etc. * Working late? No problem! Your bed is just a few minutes away! * You won’t feel guilty sleeping a few minutes more in the morning since you know that your office is nearby. TREVI was launched back in 2012 or so. It had a different look and lower prices in those days. 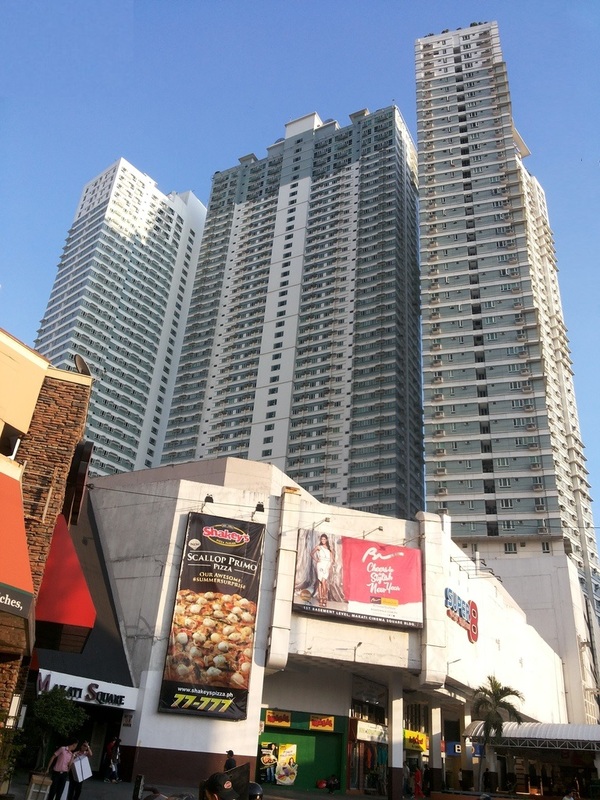 We have a number of units in Laureano di Trevi Towers located along Chino Roces Avenue (formerly Pasong Tamo) between Wilcon and Mitsubishi in front of Don Bosco near Waltermart Makati. It is also near Magallanes MRT/EDSA, near Skyway/SLEX exit and PNR. The Makati CBD is also a short distance away. Our units are brand new (never been used), with new appliances and furnishings as well. The expected monthly rent is 19K per month* (negotiable) inclusive of association dues. Minimum stay is 3 months. I'd be glad to show you around the area, and we can even have coffee at Starbucks at the ground level of Laureano di Trevi Towers so we can talk more about these. PNR Pasay Road station - A long term positive? Residents in nearby Condos may not like the noise, especially early in the morning. is a station on the South Main Line ("Southrail") of the Philippine National Railways. Like all PNR stations, this station is at grade. The station is located on Estacion Street (also known as Calle Estacion) in Barangay Pio del Pilar in Makati, making it only one of two stations (the other is Santa Mesa) to have its own access road. It is named after Pasay Road, the old name of the Makati section of Arnaiz Avenue. The station is the tenth station from Tutuban and is one of three stations serving Makati, the other two being Buendia and EDSA. 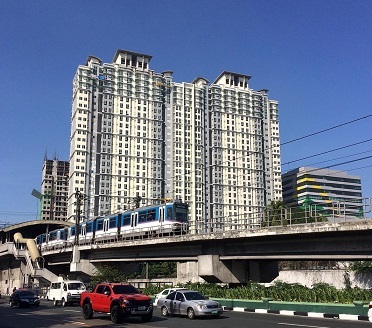 It is the only station in Makati, and the only station between España and Alabang, which serves intercity trains, being a stopping point for the Bicol Express and Mayon Limited. 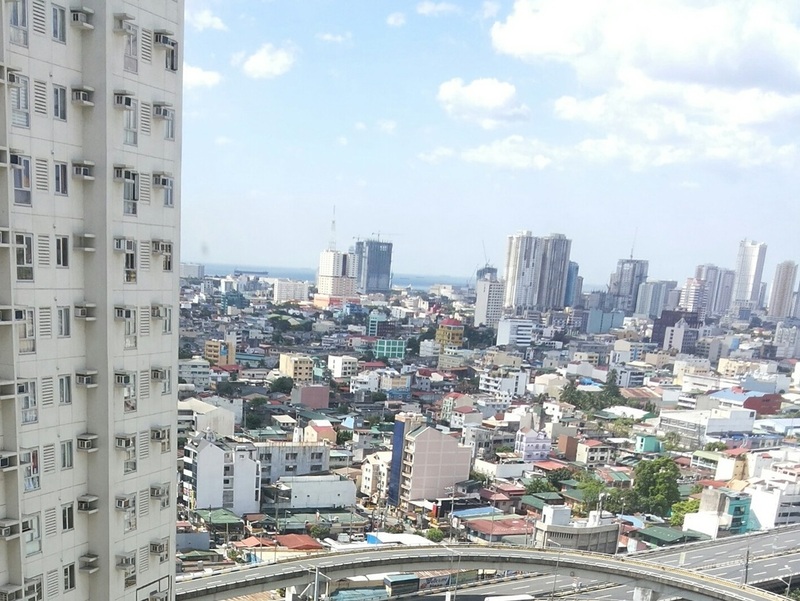 Room for growth at Pasay Road - future expanded station? ... PB. 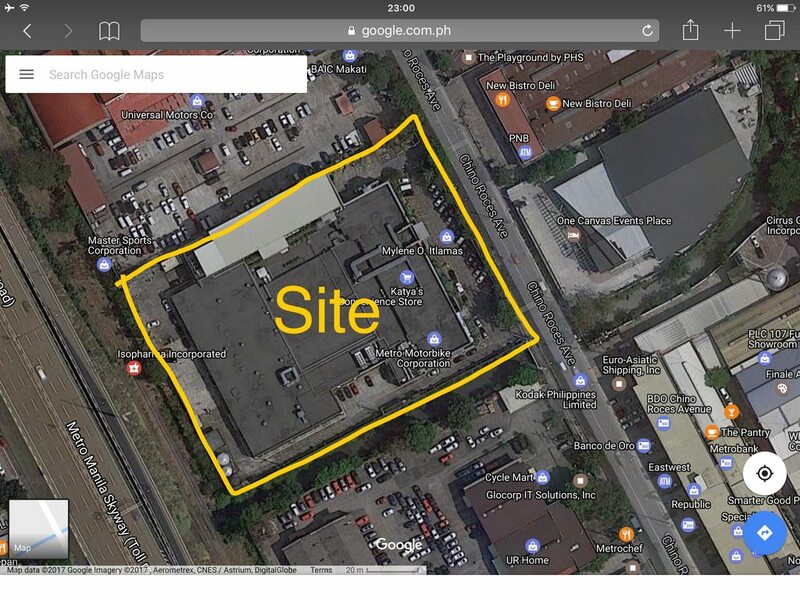 Right next to AT SanLo (and behind Waltermart) is a big patch of land across Calle Estancia which is said to be owned by San Miguel Corporation. Might the existing station be expanded to cross the street and provide a better platform for connecting to Makati? There have been reports that the PNR railway will be dramatically improved, as biillions of US$ are spent to extend it. Can be the train carriages left looking like the "monkey cages" they are now? 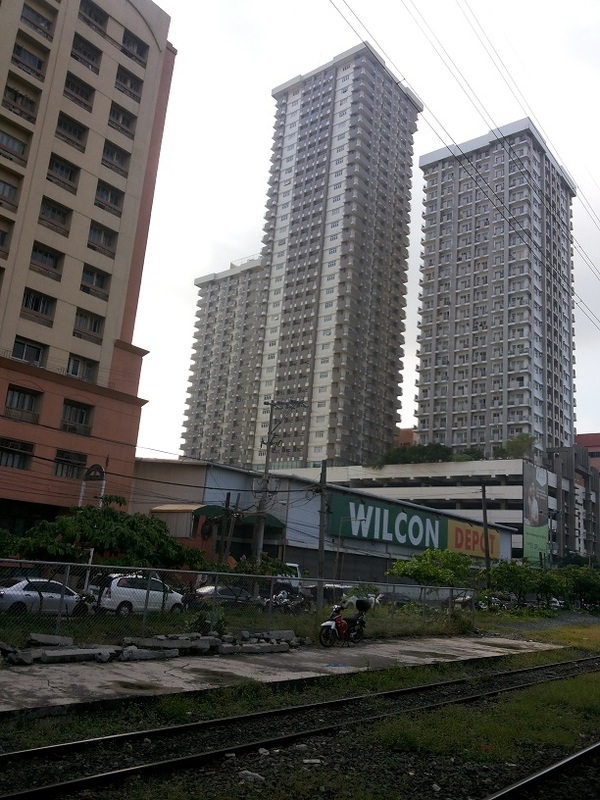 San Lorenzo Place from Empire East : "SanLo Place"
SanLo Place, where the train comes to the door - and you can usually get a seat, when headed North, towards Quezon City. There is 1 rush sale and 2 foreclosed units in this building. because neighboring San Lorenzo Place Emp/East price was hardly increased and it has (much) better connections. The high floor corner unit at Trevi sounds interesting. As you point out, there's a big gap between the recent price asked by the developer (P 5.3mn / 31 = P171k psm). and the "rush sale price" : (P 3.7mn / 31 = P120k psm. From my perspective, the owner of the Trevi unit has made some decorating errors (yellow ceiling, dark furniture). which may depress buying interest in the unit somewhat - and also the price that he/she may achieve. Obviously, these can be fixed with a modest amount of investment to make the unit more livable, and easier to rent out. 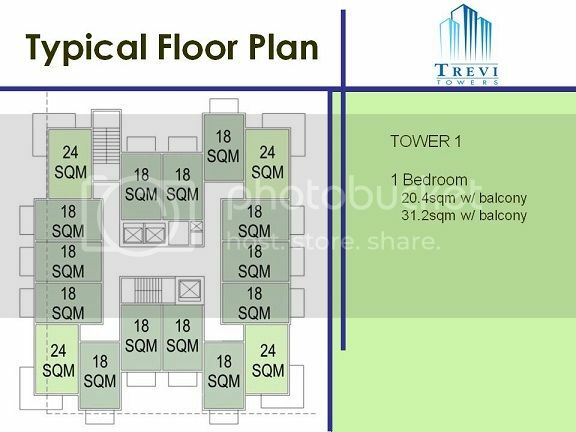 Seems corner units in Tower 1 are just 24 sqm. + 7.2sqm balcony = 31.2 sqm. I won't necessarily be rushing to buy at these prices - How useful is that balcony? 22 sqm studios at AT-SanLo can be had for P2.5mn (P113.6 psm) or less. So, if you pay P350k for the balcony and P110k psm for 24sqm, you get to about P 3.0 million. Above that, AT SanLo might look cheaper - this is just one guy's opinion. I never saw the girls with the violins in the neighborhood. This one has better detail on the amenities, etc. 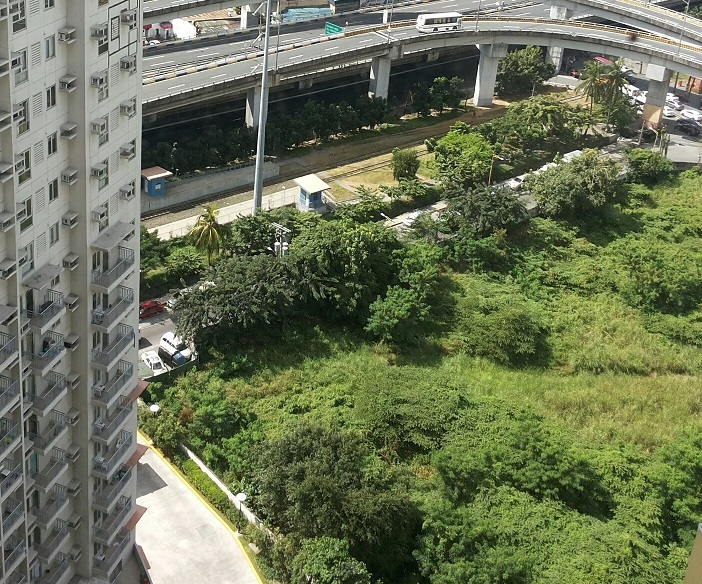 The listing website attributed the trend to the scarcity of develop-able land in Metro Manila, caused by the continued rise in population in the national capital region. “While it is not completely gone, local real estate is barely keeping up with the region’s continued increase in population, which has been the highest in the entire [Philippines],” Lamudi said. It noted that while the National Capital Region accounts for 12 percent of the country’s population, it only occupies a mere 0.21 percent of the country’s total land area. “This has resulted in the current trend, where vertical developments are mostly what is built in the metro, as high-rises do not require copious amounts of land,” Lamudi pointed out. have even been reported to sell units no bigger than 15.5 square meters. 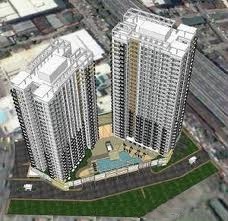 DMCI Homes Upcoming Project in Makati near MRT Magallanes Station! Still waiting for the announcement regarding the Launching Date! 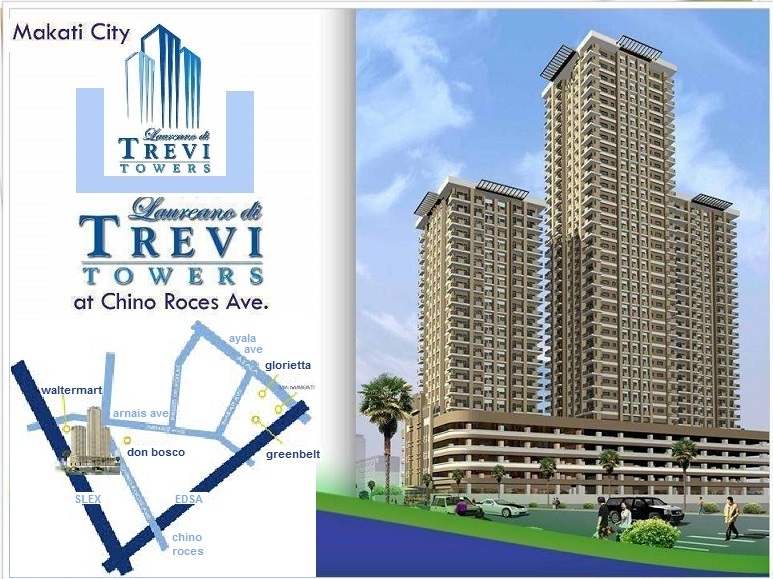 (The healthy Rental take-up at Trevi and AT-SanLo bodes well for investments on Chino Roces. I posted this yesterday on our Viber chat: "Whatta a surprise - just met with a guy managing dozens of rental units at Trevi Towers on Chino Roces. He gave me a very bullish report on Rental demand. "A Landlord's Market": that's what he called it. He could see I was surprised, so he showed me a spreadsheet with his units on it. I think he had a few dozen units ... all are the small 1br - I think they are 22 sqm + 2 sqm balcony. Near turnover available from him would be about June 7th, Most are rented out as furnished at P18k - 19k. Some were rented bare at P13k-14k, with the LL paying the association fees. With no current availability, he has a waiting list. Some people have been waiting for weeks. More good news on Rental demand in Makati's CBD-Fringe area. The leasing manager at Avida Towers San Lo has confirmed to me that she is also seeing strong demand, just as I have heard reported at the nearby Trevi Towers. 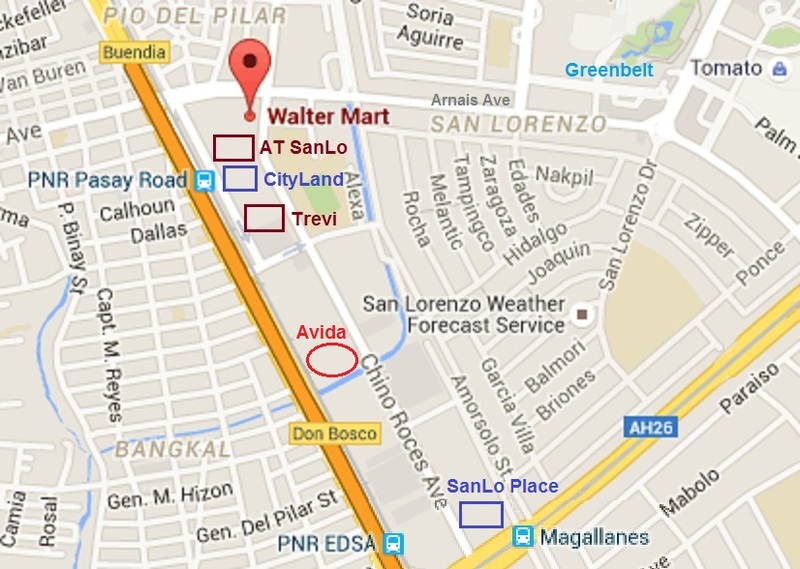 AT-SanLo is next to Waltermart on Chino Roces, and Tower 2 with 575 units was turned over last year. Avida Leasing manages over 250 units in the two towers. At the moment they have Leased out 250 units under their management, and only 10 units (3.8%) are vacant right now. Demand is healthy and rents are stable. I asked her if she was concerned about people switching over to Beacon, when Tower 3 with about 1,000 units was turned over in the very near future. She said that she expected to lose a few tenants from the (more expensive) 2BR units, but generally she was not too concerned, because asking rents at Beacon were expected to be higher, and most tenants were happy with the (lower) rents they were paying now at AT-SanLo. 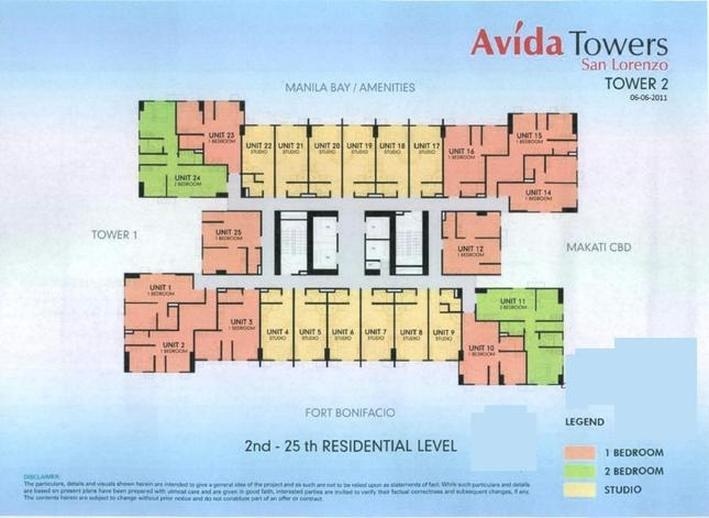 The Avida Leasing website shows: 0x bare studios (22-24sqm) offered at P12,000-13,000 monthly (in the past, but not right now), 3x semi-furnished or furnished studios at P16-19,000; 4x furnished 1BR units (about 33-38sqm) offered at P22,000-30,000, and 0x furnished 2BR units (52 sqm) offered P35,000-40,000. Beacon Tower 3 (on the left) is new, and should be turned over starting in the first half of 2017.
in rents in the more affordable properties nearby, and may push down rents in nearby more expensive propertie. 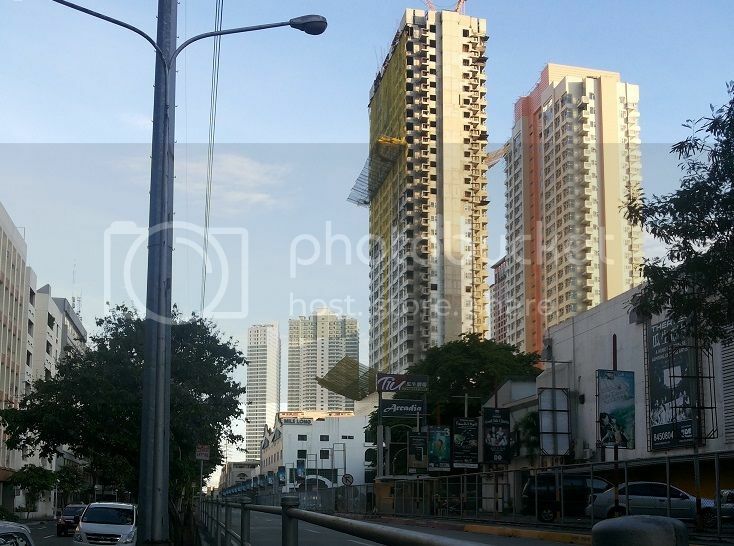 "After Beacon and SanLo Place, it may be some years before the next Tower on CR > Magallanes is completed"
Having stated that, there is a new project which is maybe five minutes North, on Chino Roces. Looking South down Amorsolo, past Paseo de Roces, with Beacon in the distance ... PB. Amorsolo Street is a minor north-south roadway that runs parallel to Chino Roces Avenue in Makati, Metro Manila, Philippines. The street starts inside Barangay Dasmariñas, continues north to San Lorenzo Village with some discontinuities and into the western edge of the Makati Central Business District where it ends at the junction with Ayala Avenue. The street is named for renowned Filipino painter and national artist Fernando Amorsolo. Wilcon has another building sandwiched between Cityland and Trevi. These stories are Old news now, but the pattern is that the purpose(s) of many properties on Ch-R may change in the future. Its first venture into office leasing was in January through Wilcon I.T. 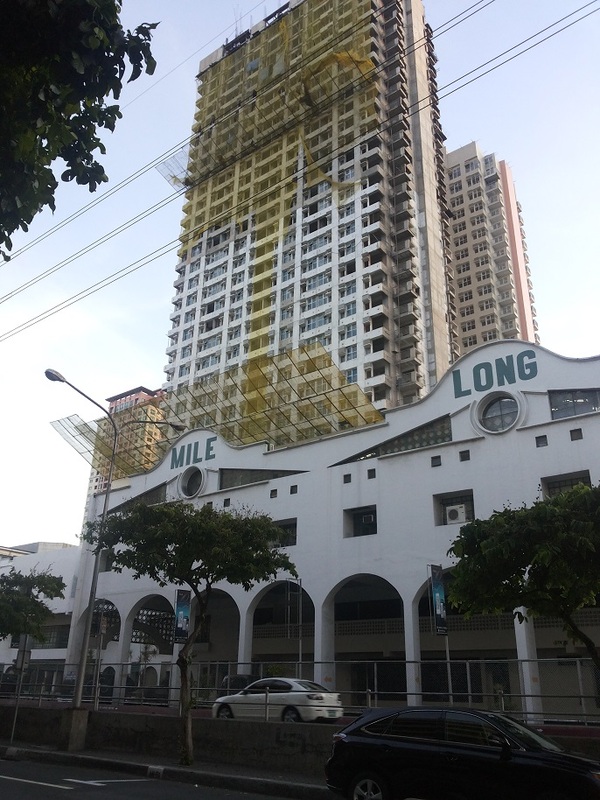 Hub, and office space at the 15-storey building in Chino Roces Avenue in Makati City have already been pre-committed as of last week, property consultant Jones Lang LaSalle (JLL), the exclusive marketer of the project, said in a statement. 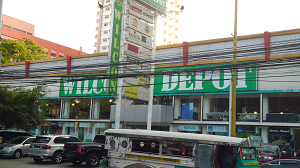 “Wilcon is exploring other properties in its portfolio of… 33 locations nationwide, which it can redevelop to cater to the fast-growing office market,” JLL said in the statement. The fast take-up of Wilcon I.T. Hub was attributed to its 3,300-square-meter (sq.m.) floor plate, which is “rarely seen” in an industry that has an average size of 1,500 to 3,000 sq.m. for a traditional BPO building. Nestled in a warehouse complex on Chino Roces Avenue in Makati City, La Fuerza Compound is an expanding new retail hub for furniture, art, lighting and home décor. add greatly to your cost. YOU cannot Sell these flats at P 200k - maybe Avida can, but a reselling buyer cannot get that much. but I would not be happy to pay more than that. - the cheap ones go fast. Last time I checked, Avida leasing had leased out all but 10 of its 260 units in AT-Sanlo. That leaves normal turnover. BTW, I am happy in my SanLo small unit. It suits me better than a hotel room - maybe I should take a photo - it is much more live-able than the above one. Because it is only a 12 minutes walk from Greenbelt mall, I do not mind slightly small windows. I have invested a modest amount of money in extending the kitchen counter, and adding a nice mirrored wardrobe to make the flat brighter. When my (larger) unit is completed at Kroma, I will probably move there, and will then either SELL or Rent out my small 22 sqm Avida studio. I reckon, if I can net P 120k per sqm (P2.6mn) or more by selling, I will be very happy. The units have all been turned over, and are renting well. There seems to be an almost unlimited rental demand for cheap flats, a short walk from Greenbelt, so a buyer can be found at P 2.6mn or more. One thing I found very surprising as that Avida was reported to have bought a large plot of land, 3 minutes walk from where I live at P 2 billion pesos. 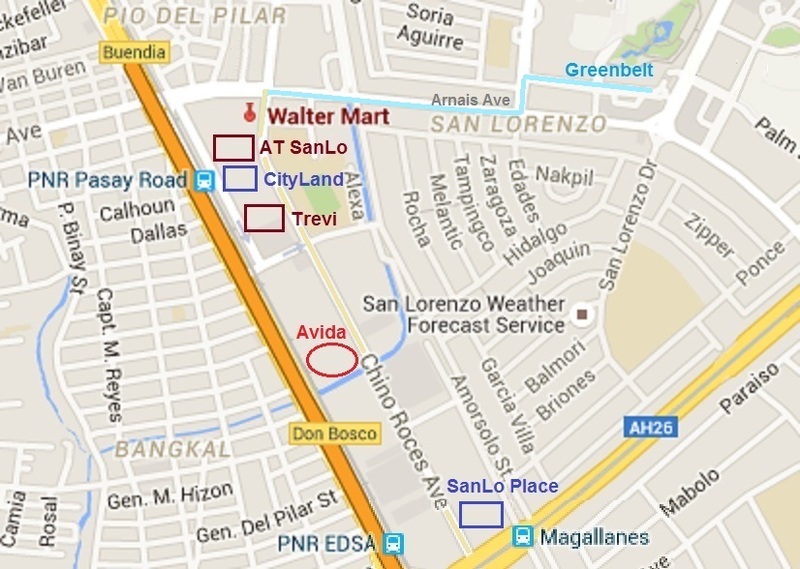 Visit Chino Roces thread - focuses on the area between Waltermart and Magallanes MRT station - where San Lorenzo Place is located. on the Northern end of Ayala Avenue. The developer of the project below is rumored to be Ayala Land. A tight office market is helping. 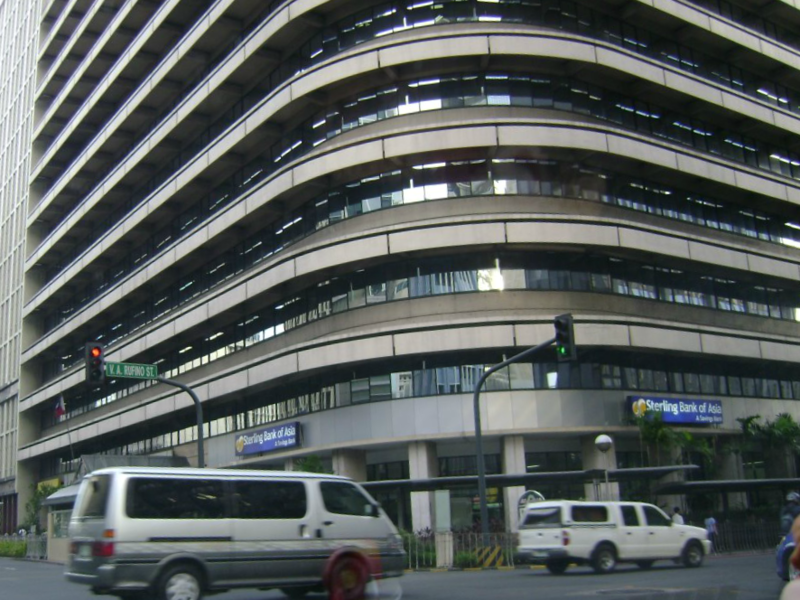 SSS Building, Ayala Ave, and Ruffino St. was built in 1966 (51 years ago) and has been occupied by the PDIC. The employees of Philippine Deposit Insurance Corp. probably thought they had seen the last of their former office—a decrepit structure along a flood-prone section of Chino Roces Avenue in Makati City—after they moved to a “better location” a few years ago. This better location, the Social Security System building on the corner of Ayala Avenue and Rufino Street in Makati City, isn’t too swanky either since it was built in 1966 and is not a modern high rise, but is classified as a “class B” building. But it does have the benefit of being located in the country’s most expensive address for offices, and… well… employees never have to contend with anything worse than puddles even during heavy downpours.
. . . Unfortunately for the officers and staff of PDIC, the new leadership of the SSS has better ideas to realize greater value from this expensive piece of real estate. Biz Buzz learned SSS was eyeing a joint-venture deal with a yet-to-be-determined partner to redevelop the 12-story structure into a gleaming high rise building that will maximize the investment value of the property. And the prospect of building a high rise on the spot is giving SSS investment officials wet dreams because—thanks to the relatively large size of the property—any building that will be built on it can probably have 50 stories (or more) of sellable or leasable space (the PBCom Tower across the street has 52 stories aboveground and seven basement levels sitting on a smaller footprint). Of course, the most ardent suitor for the right to partner with SSS and develop the property is none other than Ayala Land, we hear, because well… it’s its home turf, Ayala Avenue, after all. But Biz Buzz learned SSS is playing coy and is entertaining other suitors who may be willing to give it a better deal than the blue-chip Ayala firm. No one knows which way the new SSS leadership is leaning, but the chair of the private pension fund wants nothing less than an “iconic landmark for its members as a sign of stability,” we were told. On the upside, the old PDIC building is being refurbished, inside and out, so that the returning staffers won’t feel like rejects, given the important role they play in bank regulation and supervision. And most importantly, the Makati City government has repaired the problematic drainage along Chino Roces, so hopefully, no more flooding. That’s something to look forward to, maybe. 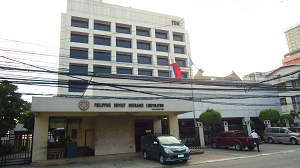 The PDIC's old building on Chino Roces,is near Don Bosco, south of Waltermart. It is only 1 lot away from Avida's P 2 Billion land purchase. Q: Can I drop by the Mozilla Community Space Manila at any given time? A: NO. MozSpaceMNL is managed by local Mozilla Reps. They are all volunteers and have their daytime jobs. Most of the MozSpaceMNL activities are held on weeknights and on weekends. MozillaPH events may require pre-registration. Be sure to check the Events Calendar from time to time. Anecdotal report from a seller (Kelvin G Pacelo) who can't distinguish between the developer price and the market price. The Total Contract Price was 3.1 million pesos. Today, the same unit is valued more than 4.2 million pesos. That's a whooping 1 million increase in less than a year! I'm happy that all of my clients are making money with my help. Really, making money by helping others make more money is a fulfilling career! I'll never leave this job! Real estate is one of the easiest and safest way to earn money. All you need to do is wait, wait, and wait as your money grows exponentially. Also, this is one of the aftermaths of PDutertes Build, Build, Build program. We have a great nation leader, people! Philippines' economy is growing fast! There is another reason why I like the Chino Roces area, -- it is its proximity to the Bay Area. And therefore these units are also an indirect bet on the rise of the Bay Area as a major commercial/lifestyle hub. 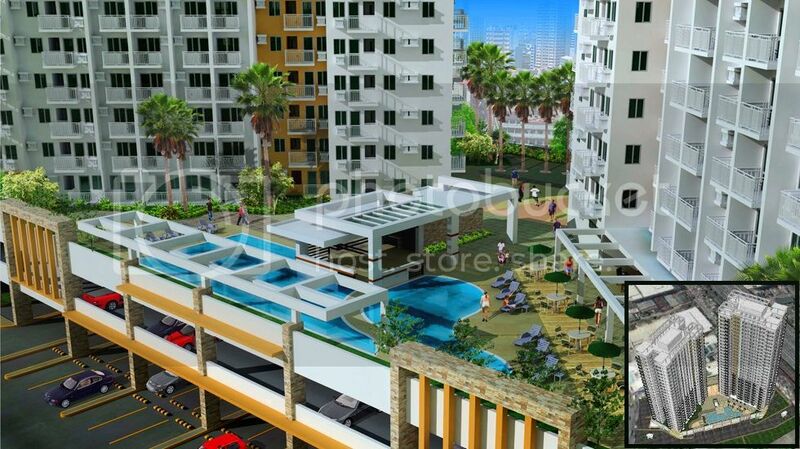 around PHP55,000 to PHP65,000 per square meter depending on the payment plan. Pasong Tamo are the rusty-red, and blue buildings. BTW, how do you get easily to Manila Bay from there? I have used public transport and jeepney's, and it seems to be a 2-3 leg journey. Maybe that will change in future. That's about PHP87,500 per square meter, not bad. 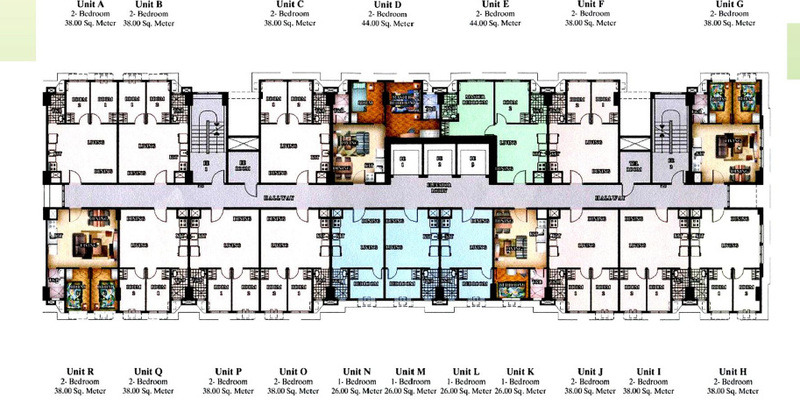 which is about PHP104,500 per square meter. What's up with Empire East????? Why are they able to charge almost 80pct to 90pct per square meter more than similar Avida San Lorenzo/Trevi?? but they give a 10discount, so the price is close to 5,6 Million incl VAT. That s approximately PHP148,000 per square meter, and this is not even the center of Makati. And what I find strange. They are holding lotteries. So many buyers there appear to be. Or is this just another marketing trick??? THE LONG WAIT IS OVER!! Empire East will release newly opened units in SAN LORENZO PLACE tomorrow, August 25. Drawlots will be held in our Makati Head Office at exactly 10.30am. Registration starts from 9am up to 10am only. We offer 10% PROMO DISCOUNT for all these units. For more details, kindly contact our Broker's Hotline at 0917 858 4823. 1.) Reservation Fee must be in the form of Cash (25k). 2.) Transferring of unit is not allowed. 3.) Change name request shall not be entertained. 4.) Post-Dated Checks must be given to qualify for move-in in RFO units. a Robinsons Land development, has ready for occupancy units costing approximately 75K to 80K per square meter. Note: this is a much better deal than Kai Garden Residences IMO. Battling Lies, market, and Spin - is what this website is all about. WHY do people continue to buy from Developers when such big discounts are available in 2nd market?
. . . E: Yes M, they thought that buying form the developers are quite easy because of the ready financing scheme.. Second, sometimes, they are thinking that the reseller of the unit in the secondary market is getting big profit .